The Tracee Ellis Ross for JCP Collection was just released yesterday. Whooo hoooo! 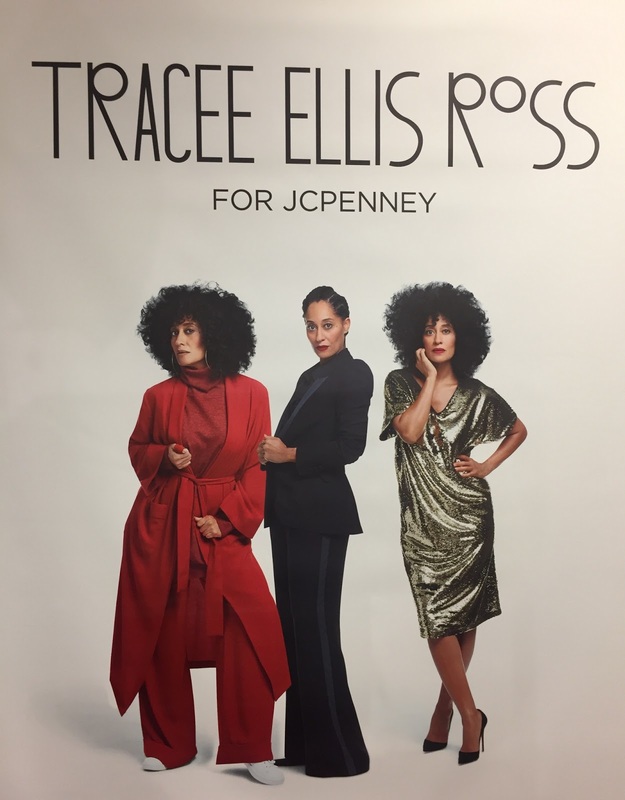 I'm a big fan of Tracee's and I got excited when I saw the ads for her collection. 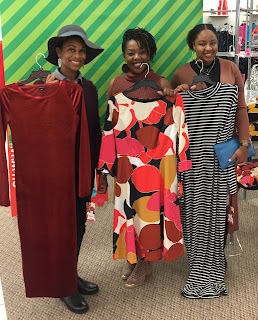 I was even more excited when I heard about the By Kikisoul Pop N Shop Meetup at the JC Penney at The Streets At Southpoint in Durham, NC. Thank you Kiki and Tierany for a great event. I went along with my sister and niece and we were thrilled at what we saw. Based on the lines at the registers, other ladies were also impressed. 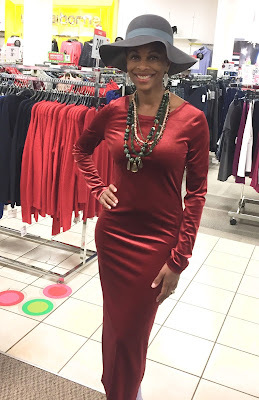 Since I write about all things weddings, my approach is showing you options from the collection you could wear to a wedding as a guest, specifically a winter wedding. 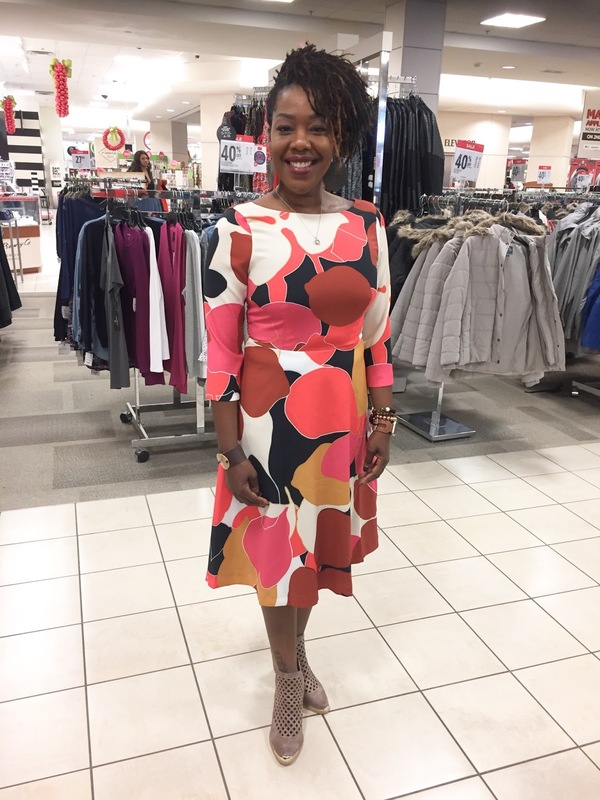 My sister Michelle is wearing the Glorious Elbow Sleeve Fit And Flare Dress. This is my favorite dress in the entire collection. It's so lady like! The color palette is beautiful, and the hemline is the perfect length to be able to sit for dinner without any problems and then comfortably dance the night away. You won't believe the price! It's $34.30 when you use code 6SHOPJCP at checkout. My niece Jacinta is wearing the Kindness Long Sleeve Mock Neck Bodycon Dress. She totally rocks this dress which hugs in all the right places without looking like she's trying too hard. 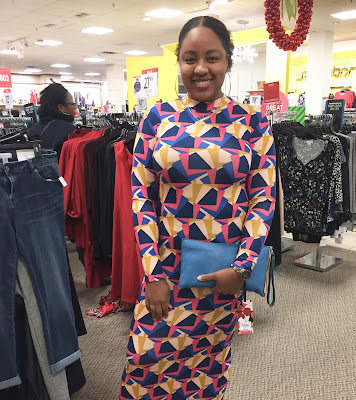 The print is interesting and fun and it's youthful. Perfect for a young woman like her. It goes for $34. This model got big applause when she came out of the dressing room wearing the Miracle Long Sleeve Kimono Jacket over the Joy Of Life Strapless Jumpsuit. This is a really comfortable look for a winter wedding. It gives you a pretty pop of color for the ceremony and dinner and you'll still look hot once you turn up on the dance floor and take off the jacket. The jumpsuit is $59 and the jacket is $59. I came home from the event with the Illuminated Long Sleeve Velvet Bodycon Dress. I don't plan to wear it to any weddings I'll MC this winter. I think this will be just right for New Year's Eve. I'll pair this dress with some sparkly jewelry. I love the texture of the fabric and this dress felt so good to wear. It hits about mid-calf which was perfect. I may have the sleeves altered just a bit because, as you can see in this photo, they're just a hair too long. This collection truly has something for everyone. The sizes go from small to 3X. I think the way the pieces are named is pretty cool too. They have names like glow, kindness, glorious and illuminated. How could you not feel glorious wearing a piece named glorious? If you see a look you like, I suggest you order right away or get to a JC Penney store quickly. As of this writing, many of the selections are out of stock online or the sizes are limited. What a great launch! Way to go Tracee and JC Penney. 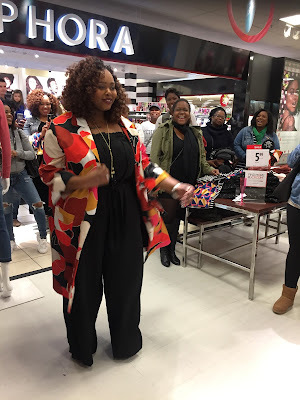 I was there at the launch as well and your choices are on point! I was really impressed with the collection. Thanks so much! It was a fun time.